State Representatives and officials from Milwaukee, Sheboygan, Shorewood, and Oak Creek-Franklin come over to Kelda Roys for Governor. 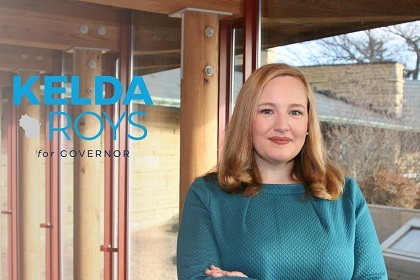 MADISON, WI - Kelda Roys has secured the endorsement of several state and local elected officials throughout Southeastern Wisconsin. Roys has previously been endorsed by many national and state organizations and leaders, including EMILY’s List, Sen. Kirsten Gillibrand, NARAL Pro-Choice America, Bon Iver, the Network for Public Education, the Wisconsin Gazette, Women’s March WI, National Organization for Women - Wisconsin, Feminist Majority PAC, WUFPAC, Demand Universal Healthcare, Moms Demand Action Candidate Distinction, #VoteProChoice, Andy Gronik, Outagamie Co. Exec. Thomas Nelson, Diane Ravitch, Rep. Lisa Subeck, Rep. Amanda Stuck, Rep. Nick Milroy, former Sen. Jess King, philanthropist Lynde Uihlein, and many local elected officials and leaders. Kelda Roys, 39, is a small business owner, attorney, former state representative, and past head of NARAL Pro-Choice Wisconsin, who has been standing up for women and families throughout her career. In the Assembly, she stood out as an influential and effective lawmaker, delivering results for working families and helping lead the opposition to Governor Scott Walker’s divisive agenda. As the parent and stepparent of four girls, Roys will fight for paid family leave, affordable childcare, student debt relief, great schools, and healthcare for all. In a year in which Wisconsin voters are ready for change, Kelda Roys provides the clearest contrast to Scott Walker.